This fall I have been impressed with some Maryland grown concord grapes that I’ve been able to get at a local farmers market. The “grape” flavor is so intense and sweet that I’ve been eating them like candy. Since I always have beers aging and souring, thanks mostly to brewing 10-gallon split batches (5-gallons clean and 5-gallons for mixed fermentations), I knew I wanted to incorporate these grapes into a beer while they were still available and tasting great. After sampling what I had aged, I picked an 8-month old 100% wheat beer fermented with a mix of bottle dregs, Wyeast 3711 French Saison yeast, and the Yeast Bay’s Amalgamation blend of six different six different Brettanomyces isolates. 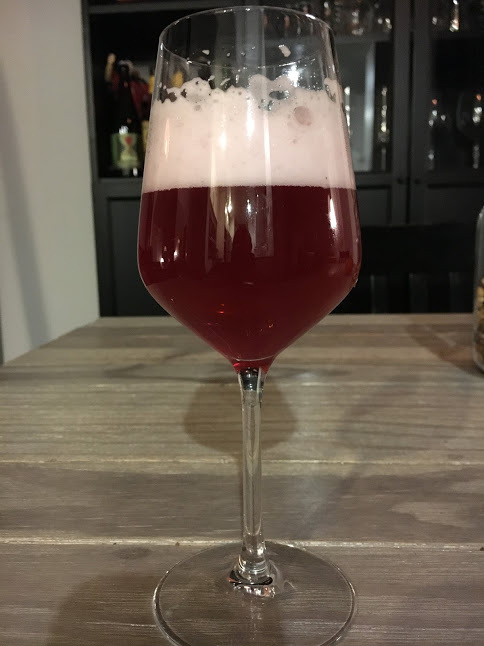 Because of the intense flavor of the Concord grapes, I was cautious of overusing them which would overpower the complex mix of funk and acid that built up over the months; I ended up deciding on a half pound per gallon of beer. After removing the grapes from the stems and washing them off, I put them in a sanitized bag and placed the bag in a bowl and used a potato masher to gently push down on the grapes to break them up a bit. 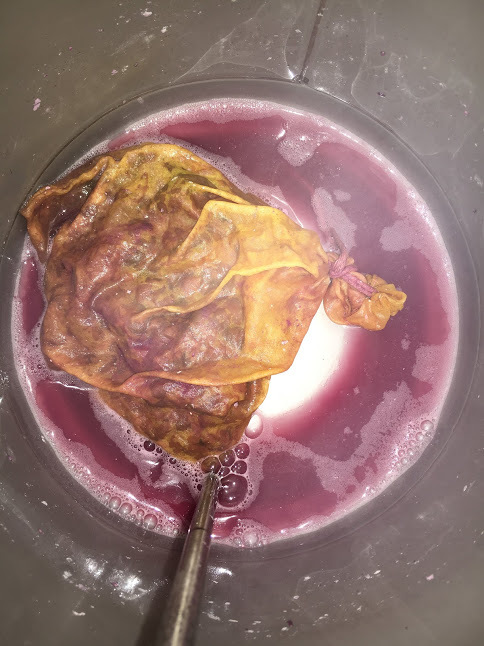 All the grape juice that was pushed out in the bowl I dumped into an empty and purged keg along with the nylon bag of grapes. I’m always interested in trying to push the fruit character as much as possible by incorporating wine strains known for their bioflavoring ability. Grapes have fruity bound thiols present in the form of precursors on the grape itself residing on the outmost layer of the fruit. To release these bound fruit-forward thiols, a yeast strain is needed that produced an enzyme called beta-lyase. Thanks to research done with wine, many wine strains have been tested for this bioflavoring potential. I’ve experimented with a number of them but was ultimately drawn to blend of strains packaged together called Alchemy II. The blend has been scientifically created to enhances volatile thiols like boxwood, passion fruit, grapefruit, gooseberry and guava aromas. Although the blend does contain killer strains, I wasn’t worried about this after primary fermentation and aging had already taken place. Along with the grapes in the purged keg, I sprinkled in 2 grames of the Alchemy II blend and racked the 100% sour pale wheat base into the keg. In addition to the potential bioflavoring from the yeast blend addition, I like the idea of adding some fresh yeast to a beer that’s been aging to help with a healthy fruit re-fermentation. 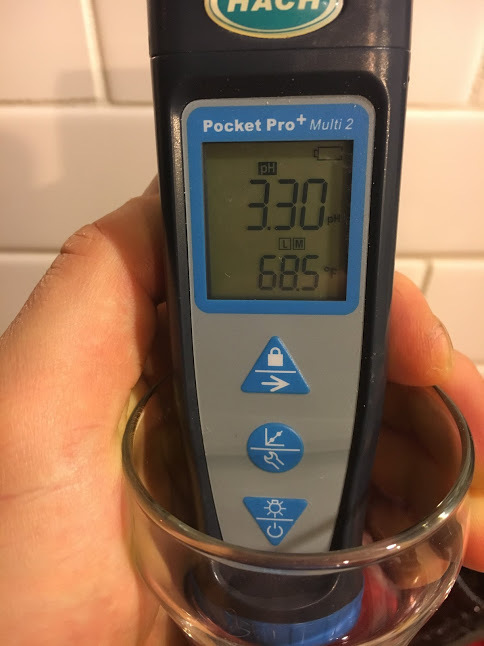 I left the keg at room temperature with a spunding valve on to maintain 5 PSI pressure, which also releases any pressure more than 5 PSI. After a month on the grapes, I put the keg in the keezer, leaving the grapes in the keg and carbonated lightly. Wyeast 3711 French Saison, The Yeast Bay Amalgamation, and bottle dregs. 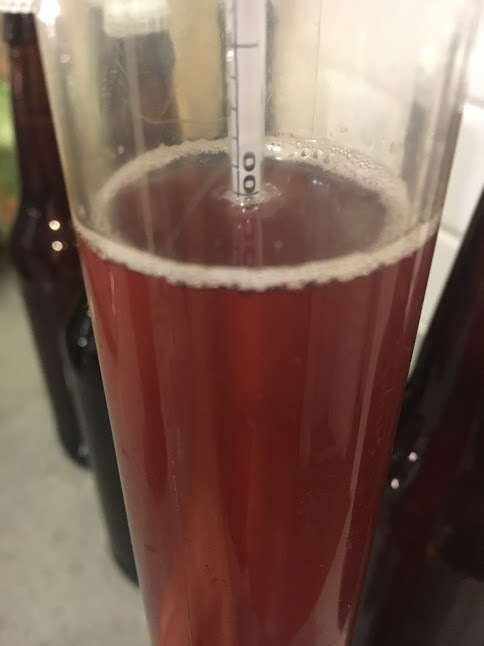 68°F (Ambient) Two Week Primary, 8-months in secondary, 1-month on local Concord grapes @ 0.50 pounds/gallon. Big jam-like grape aroma jumps out of the glass with just a little bit of funk. It would have been interesting to do half of this without the wine yeast to see if that jam character had anything to do with the yeast and fruit interactions or not. I probably could have gotten away with less than half a pound of concord grapes per gallon to help keep the grapiness from being too grape juice-like. There is a nice tart acidity that plays well with the grapes, but it’s not an aggressive sourness. The combination of grape and sour reminds of eating grape Nerds! I get more of the initial base funk in the aftertaste than I do in the nose, which is nice, it helps keep the concord grapes in check a bit (though it’s still slightly over the top). The mouthfeel is decent considering how dry the beer got (final gravity 1.001), I’m assuming the French Saison (3711) yeast helped a bit with the fullness with its natural ability to ferment out a beer but still leave a somewhat silky mouthfeel. I mashed on the high end to try and prevent the saison strain from dominating the sugar consumption, which seemed to help as there is decent acidity and funk. Overall it’s a fun beer; I could see a variation of this work at Sapwood where I’m looking forward to experimenting with different grape varieties! This looks like something worth trying! I am from Missouri, and I’m curious how Norton grapes would work. 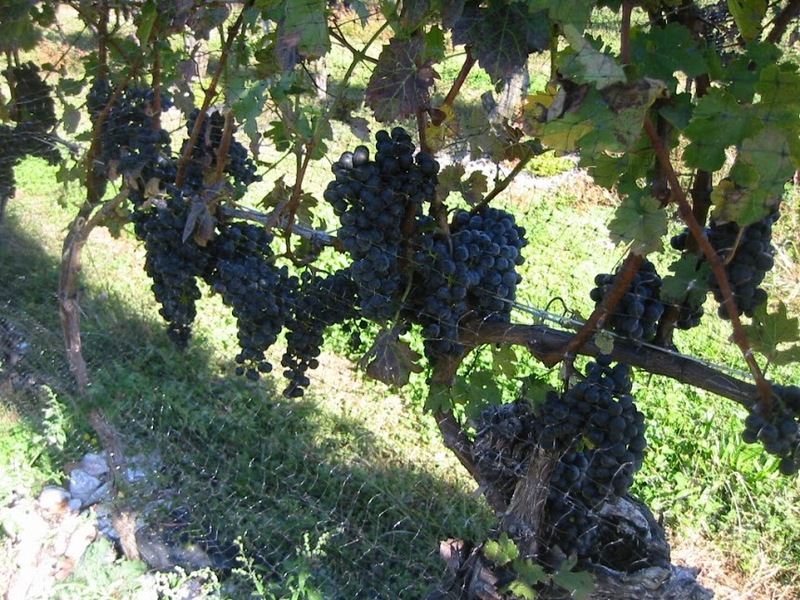 Norton grapes, if you are not familiar with Missouri wine, is a dry red wine. What are your thoughts?